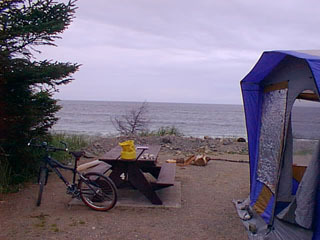 Agate Beach Campground. This site was the left end of a three-banger, but no one else camped there with me but Shelly the whole time that I was there. There are much nicer sites than this, sites that are nestled into the trees and still have a beach view, but this was the best of what was left when I pulled in. And, right after I staked down the tent (with rocks, after I hammered my thumb and split my thumb-nail trying to drive regular stakes into the ground), the beautiful site right next to me was vacated. Of course. Anyway, I got a lot of sun there, which was a good thing; it rains a bit every day, it seems. Do NOT go to the Charlottes and try to camp without extensive rain gear. I lived in Gum boots for a week. Actually, I've lived in Gum boots for WEEKS. I like them, but it took me a couple of days to learn how to walk in them without falling over everything, or dragging anything hanging loose along with me. There's an art to this camping business, you know.